Argyll, Killean Old Parish Church. 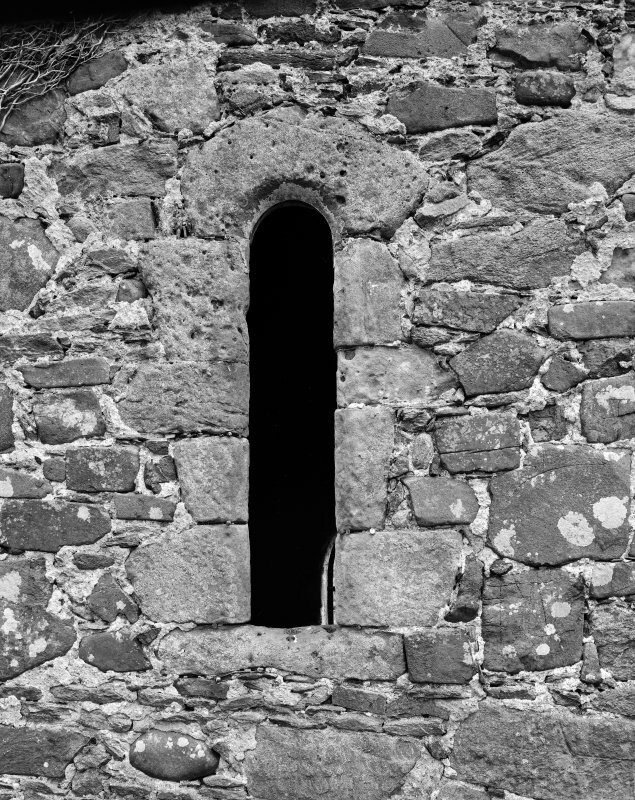 Low-side window in South wall. Argyll, Killean Old Parish Church. Window in North aisle. 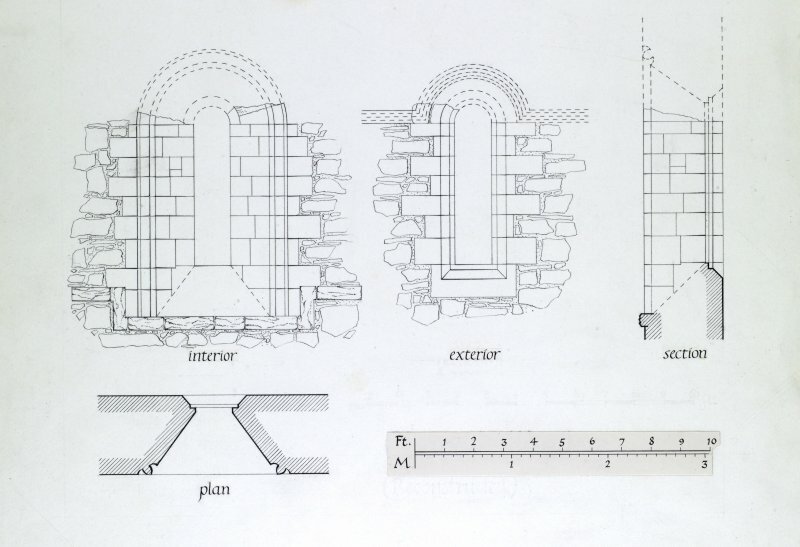 Photographic copy of elevation of windows. Quarter FS details of East window. RCAHMS Survey. 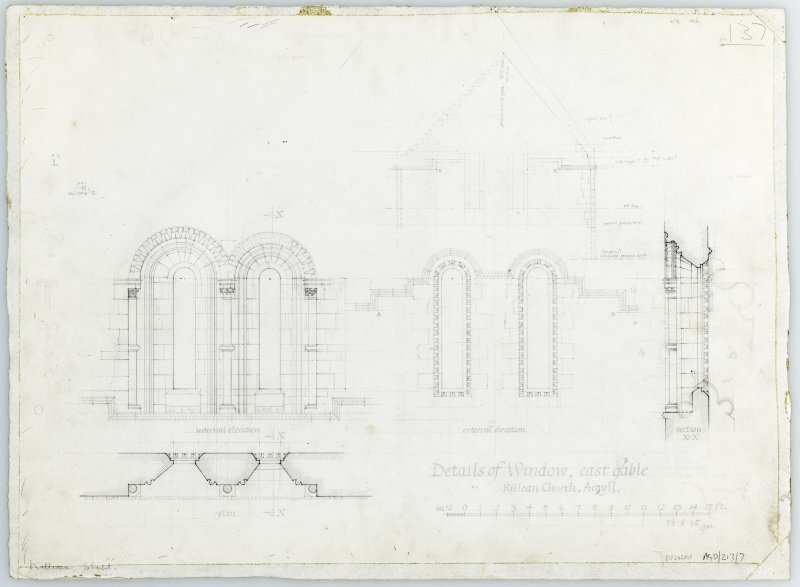 Original drawings for plate LXXIV, Sculptured Monuments of Iona and the West Highlands by James Drummond. Tapered grave-slab bearing at foliated cross a sword and a blank inscription panel. Insc: 'Killean Aug -/69'. Rectangular grave-slab bearing interlaced work, two pairs of facing animals, and a blank inscription panel above an illegable insription. 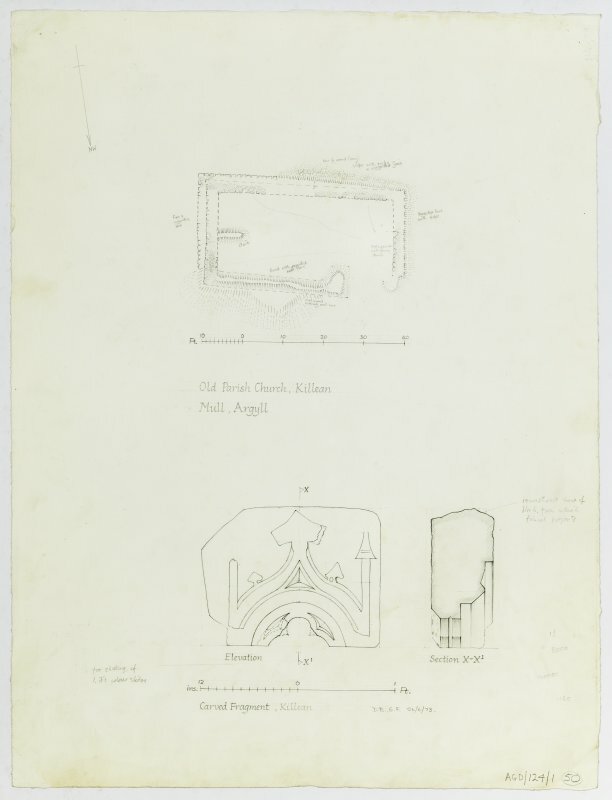 Insc: 'Killean Aug -/69'. Killean Old Parish Church. 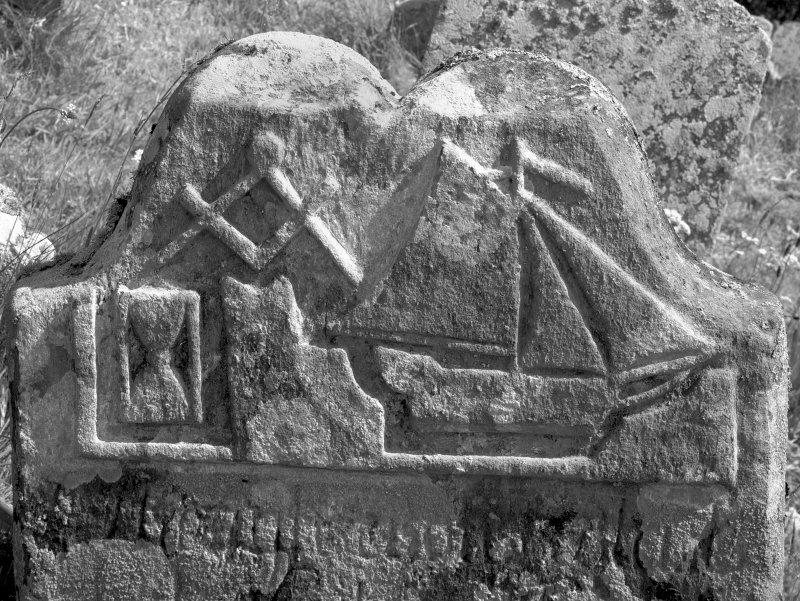 Detail of headstone of sailor. Digital image of AG 1860. Argyll, Killean Old Parish Church. Effigy. Unkown man in armour. Killean Old Parish Church. Cross decorated stone. 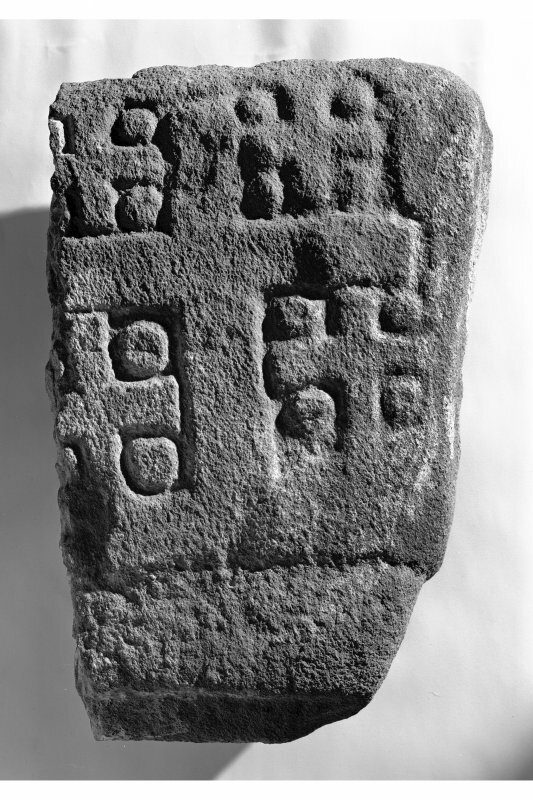 Slab bearing Latin cross in false relief between four crosslets. 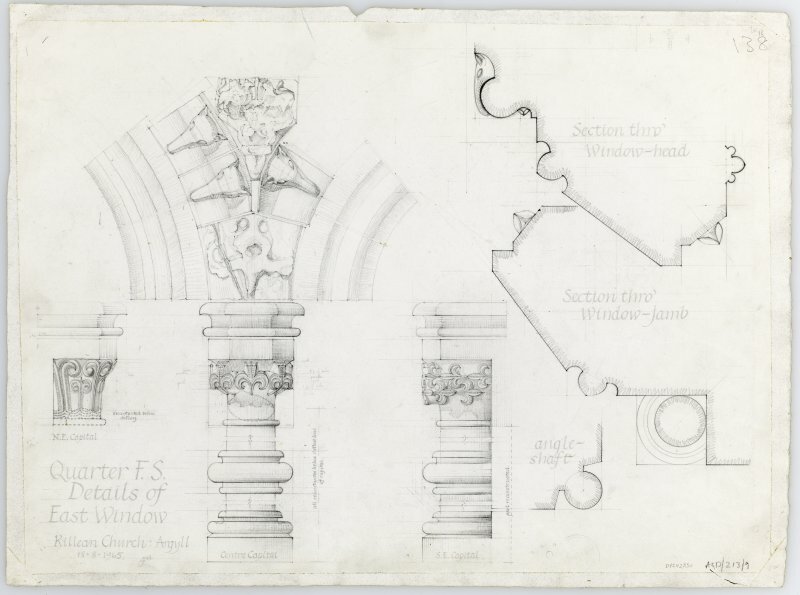 Survey drawing; plan of ground floor, carved fragment, elevation and section X-X. Argyll, Killean Old Parish Church. Details of East window. Argyll, Killean Old Parish Church. View of interior of East wall. 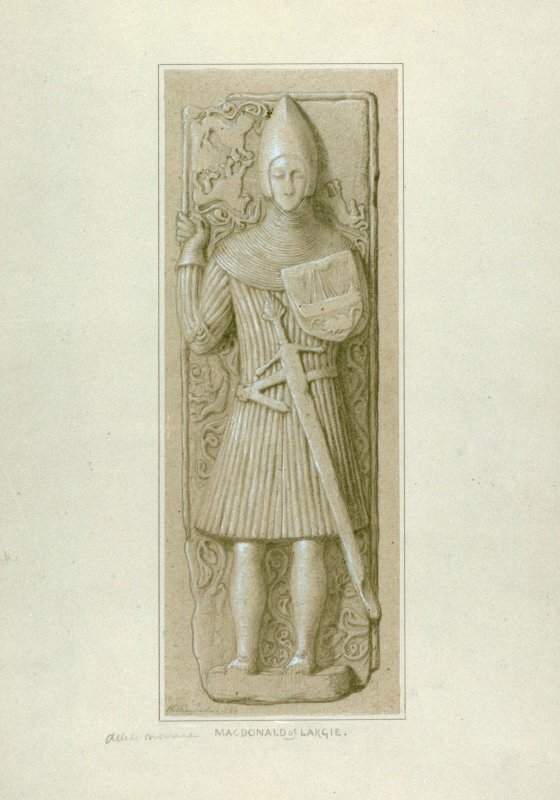 Original drawings for plate LXXV, Sculptured Monuments of Iona and the West Highlands by James Drummond. 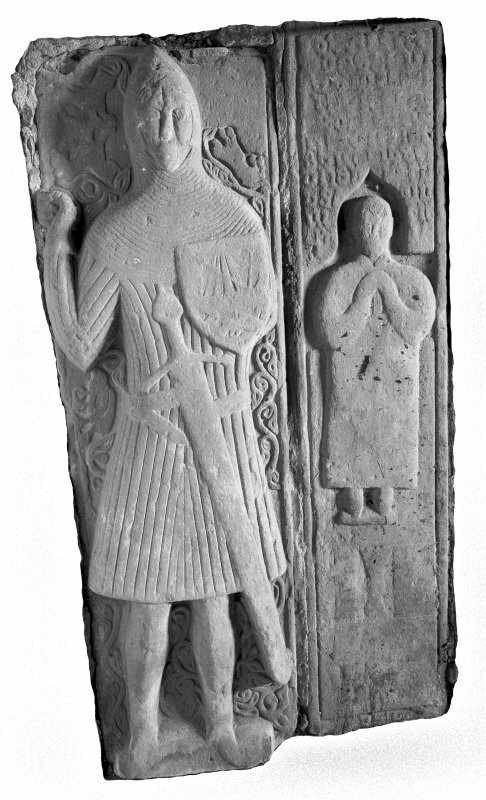 Effigy of an armoured man carrying a spear in the right hand and a shield bearing a galley in the left, identified as "MacDonald of Largie" and inscribed beneath as such, at Killean. Insc: 'Aug -/69'. 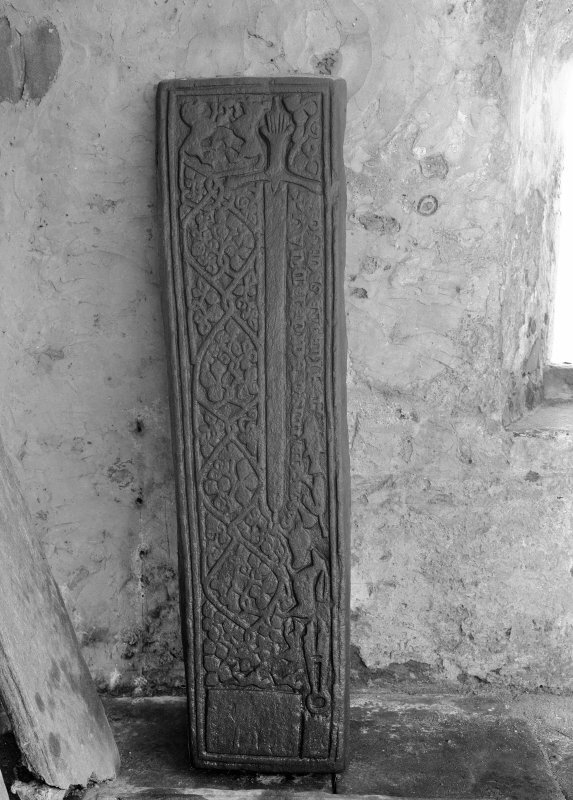 Graveslab AL16 from Killean Old Parish Church, Kintyre. 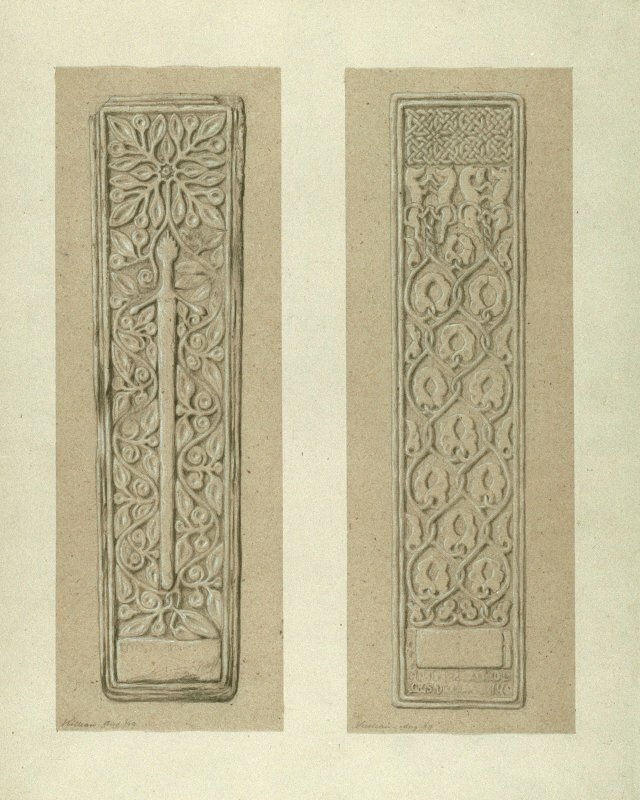 Photographic copy of drawings of decorative capitals. 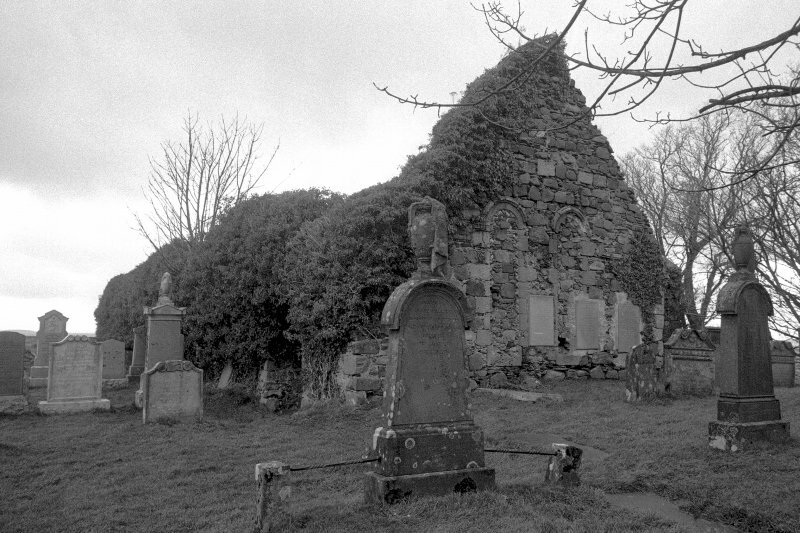 Kintyre, Killean Old Parish Church. Grave Slab. Iohannes, Son of Eugenius. 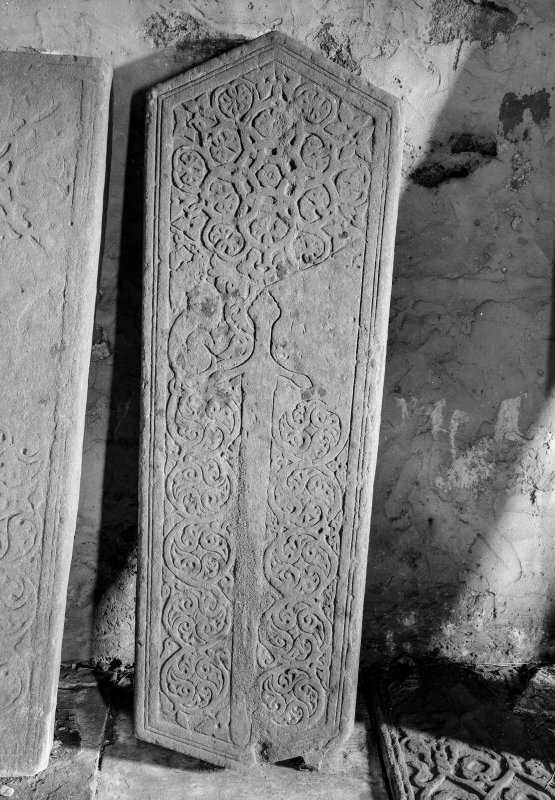 Graveslab AL3 from Killean Old Parish Church, Kintyre. Argyll, Killean Old Parish Church. Exterior of East wall. Argyll, Killean Old Parish Church. View from South-East. Details of window. East gable. 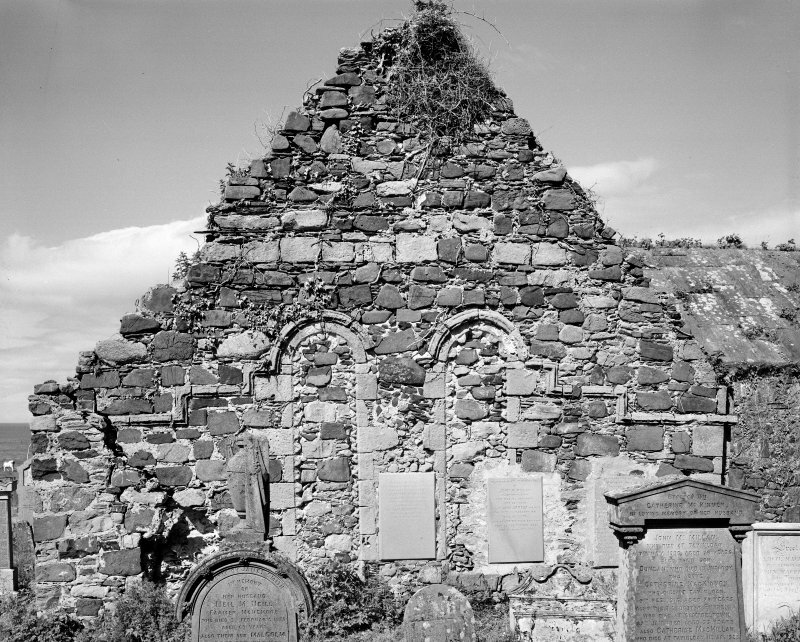 RCAHMS Survey. Argyll, Killean Old Parish Church. Window in South wall. 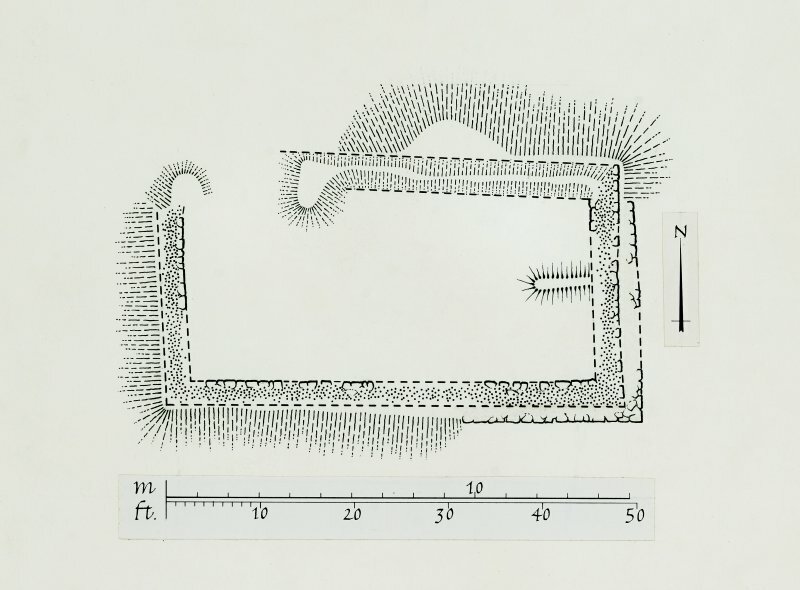 Photographic copy of ground-plan with sections dated. 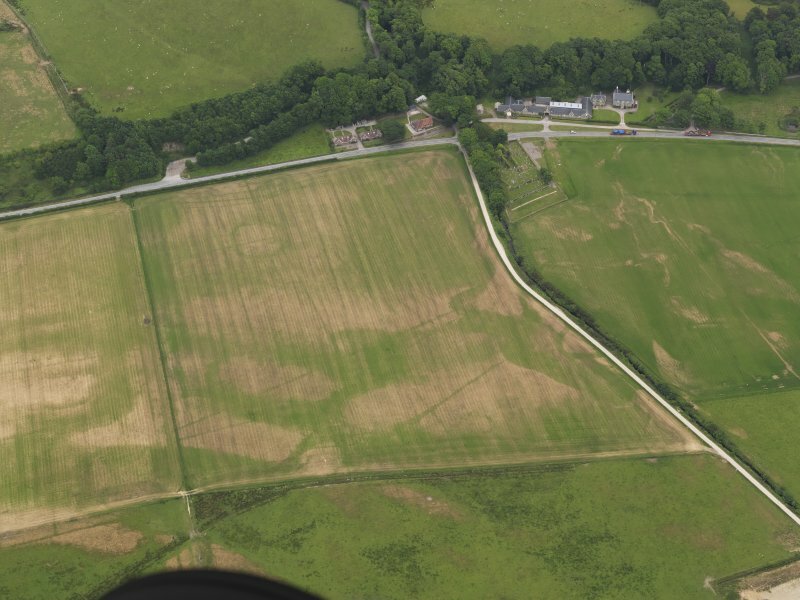 Oblique aerial view of the parchmarks of the enclosure and field boundaries with the church, burial ground and house adjacent, taken from the W.
Oblique aerial view of the parchmarks of the enclosure and field boundaries with the church, burial ground and house adjacent, taken from the WNW. 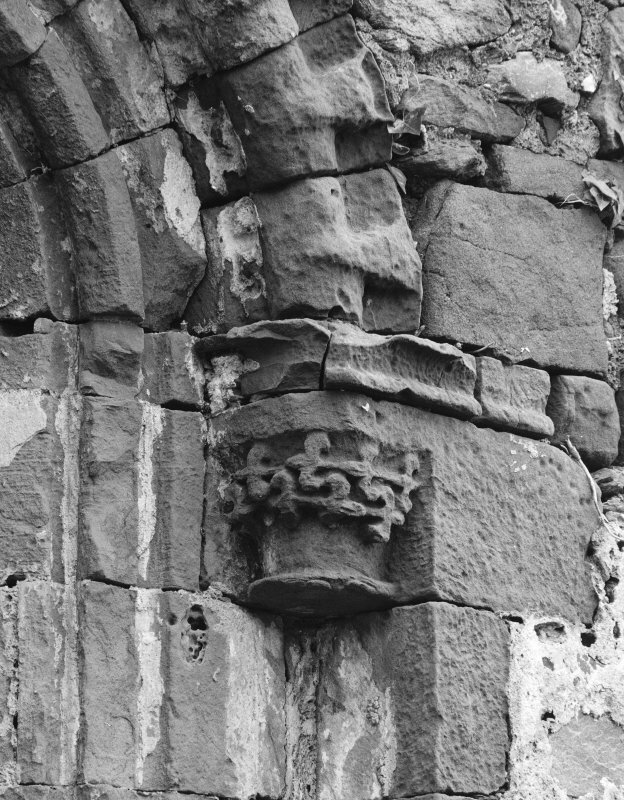 Plain cross with broken arms, in MacDonald of Largie vault. 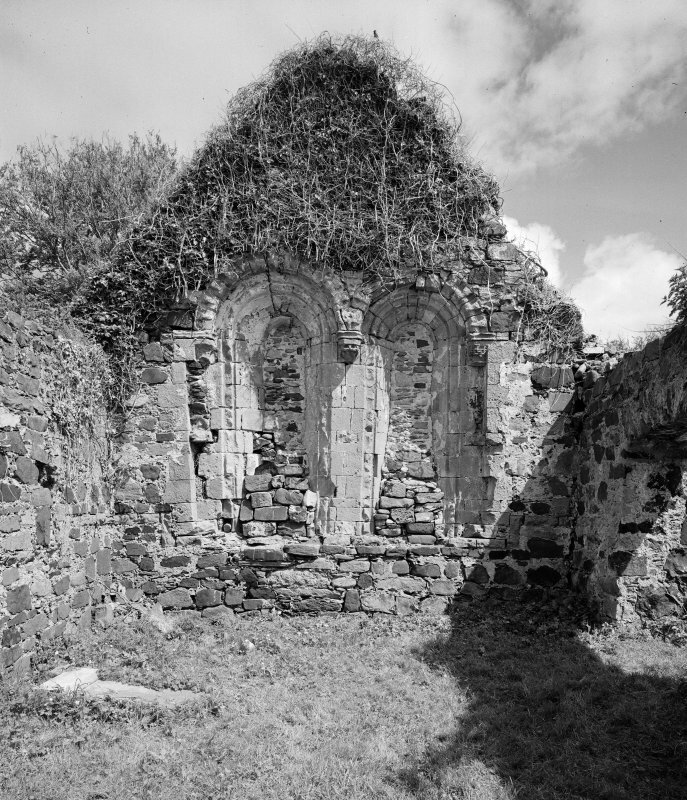 The remains of the former parish church of Killean, dedicated to St John and first on record about 1222. The church continued in use until it was finally abandoned as insecure in 1770, when a new church was built at A' Chleit (NR 6812 4178). 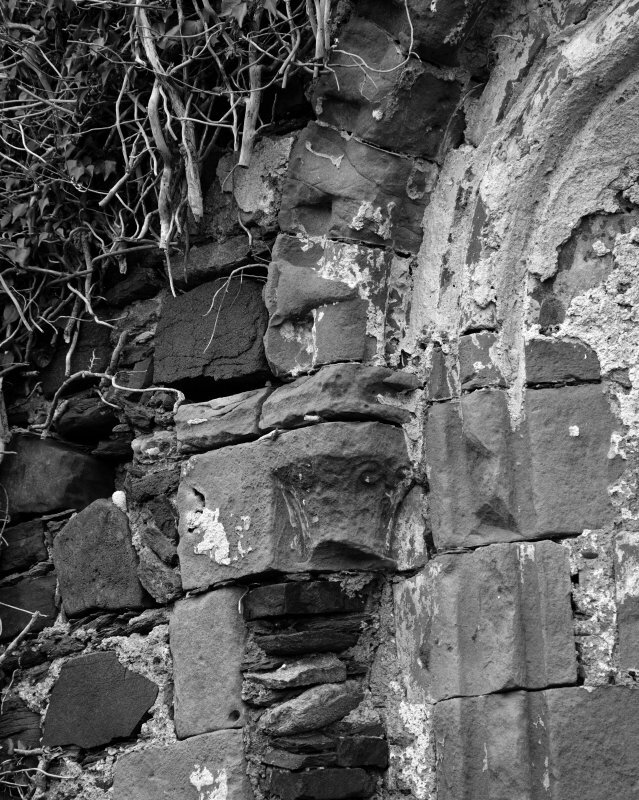 The greater part of the building is roofless, but apart from the W gable-wall, which has been entirely removed, the walls are in a fairly good state of preservation, although partially covered with a dense growth of ivy. The oldest portion of the structure is the nave, which appears to have been erected as a simple unicameral church some time during the second half of the 12th century. Early in the 13th century this church was extended eastwards by the addition of a chancel, the entire area of the original building thereafter being utilised as a nave. A second addition was made in the later Middle Ages, probably during the course of the 15th century, by the erection of an aisle on the N side of the chancel. Few alterations appear to have been made to the church in post-Reformation times and the structure seems to have remained fairly entire, although roofless, for at least half a century after its abandonment for public worship. Subsequently the fabric was subjected to quarrying. 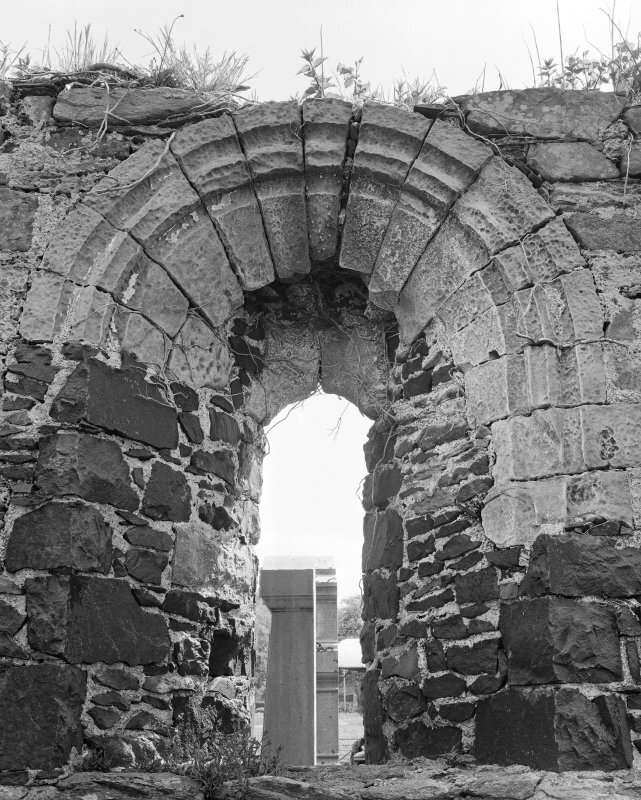 This deterioration seems to have been halted about the middle of the 19th century, perhaps as a result of the intervention of the MacDonalds of Largie, who maintained the N aisle as a family burial- vault. 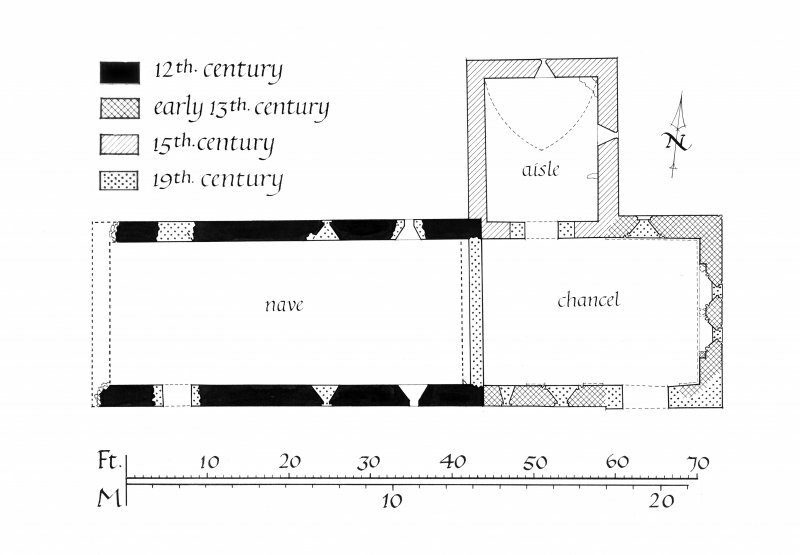 To this period there may be ascribed the erection of the transverse wall that seals off the chancel, and likewise the consolidation and restoration of much of the original masonry. 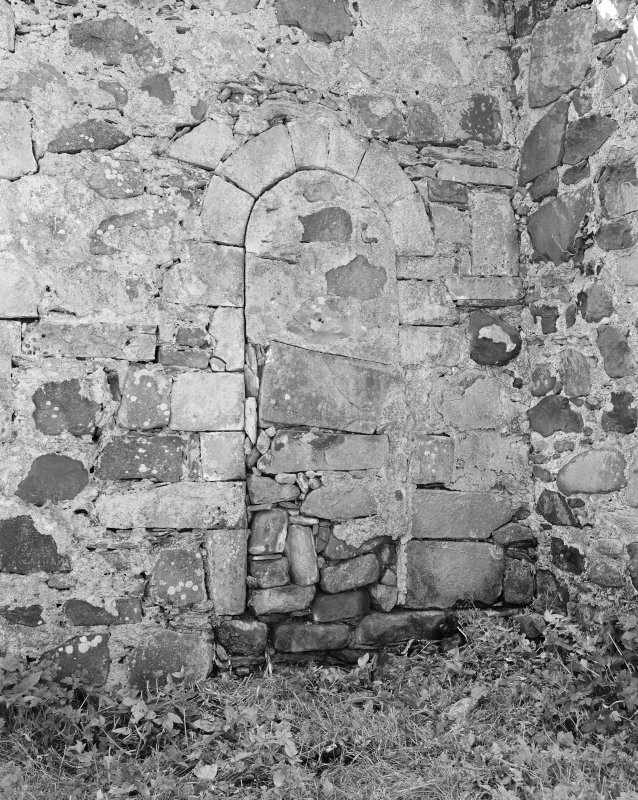 Traces of an original entrance-doorway can be seen towards the W end of the N wall, while in a corresponding position in the opposite wall there occurs an opening which may well represent the position of a 17th century, or even of an original, doorway. The masonry is of rubble, roughly coursed in the 12th and 13th century work but random in the north aisle. 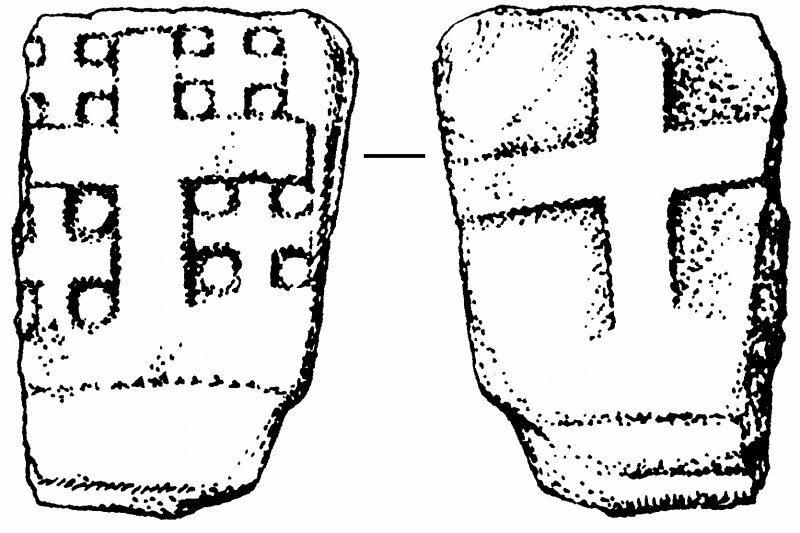 An Early Christian tapered slab bearing crosses and crosslets in false relief was found during the survey and has been deposited in Cambeltown Museum. It is rebated to fit into a socket and it seems probable that it stood upright on a 'leacht'. An Early Christian cross-shaped stone is preserved in the MacDonald vault as are all the pre- Reformation tombstones, all late-medieval, with a single exception which is still in the graveyard. 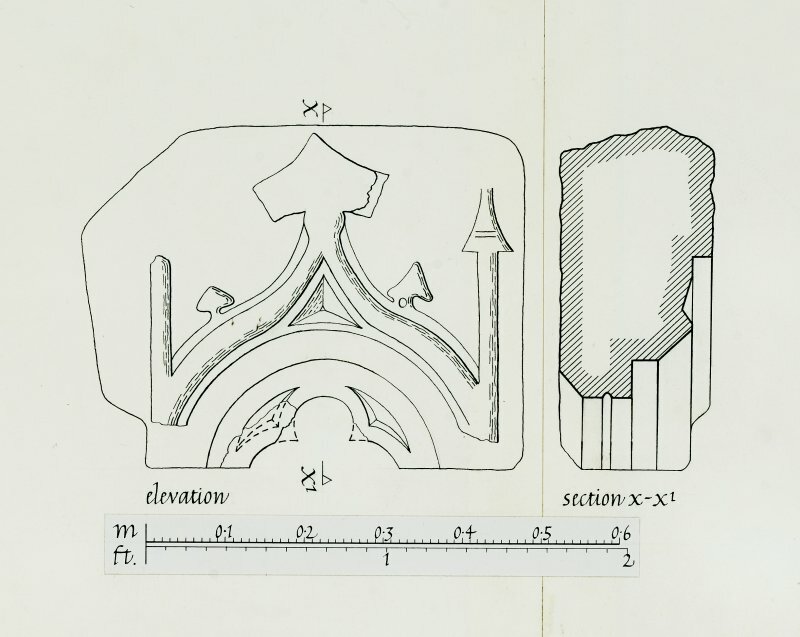 The 'Sculptured Stones' published on the OS 6" map referred to 'three or four fine specimens of sculptured tombstones' and a pedestal with corresponding, unsculptured cross (Ordnance Survey Name Book [ONB] 1869). The latter are no longer to be seen. 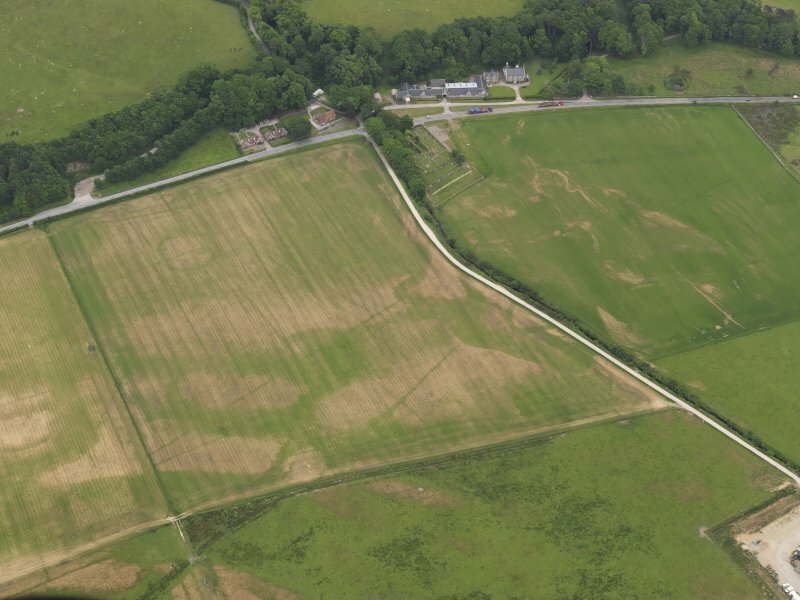 Local authorities in 1869 believed that the burial ground had extended to the opposite side of the burn, since many human bones had been found during cultivation. Killean (Argyll, Kintyre). Granted by Alexander II to the mensa of the bishopric of Argyll in 1243. 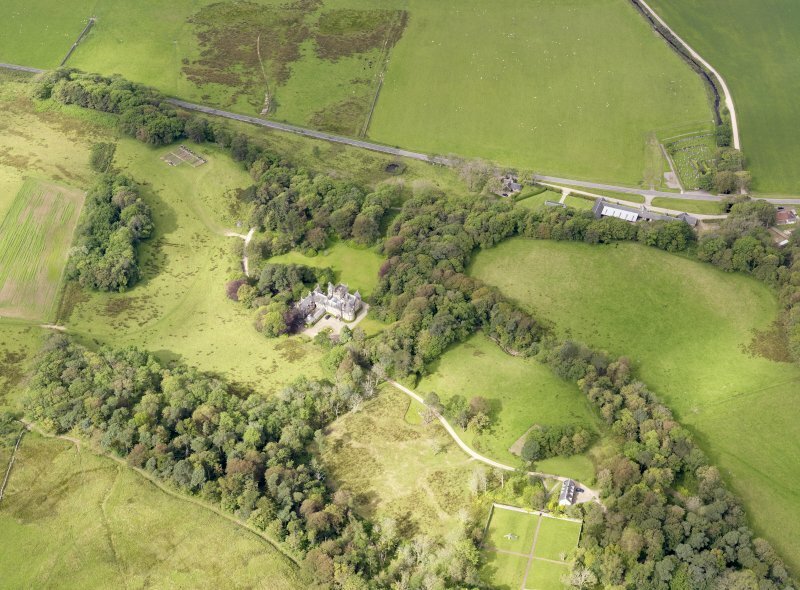 This was confirmed by James IV in 1507, the parsonage alone being annexed, while the cure was a vicarage perpetual. Visited by RCAHMS in 1965. St John's church at Killean is as described and planned by RCAHMS as is the Early Christian cross-shaped stone. The Ordnance Survey Name Book (ONB, 1869) reference to sculptured tombstones is presumably to the pre-Reformation tombstones in the MacDonald vault. The lone pre-Reformation tombstone in the graveyard could not be identified with certainty. Visited by OS (J B) 20 February 1978. 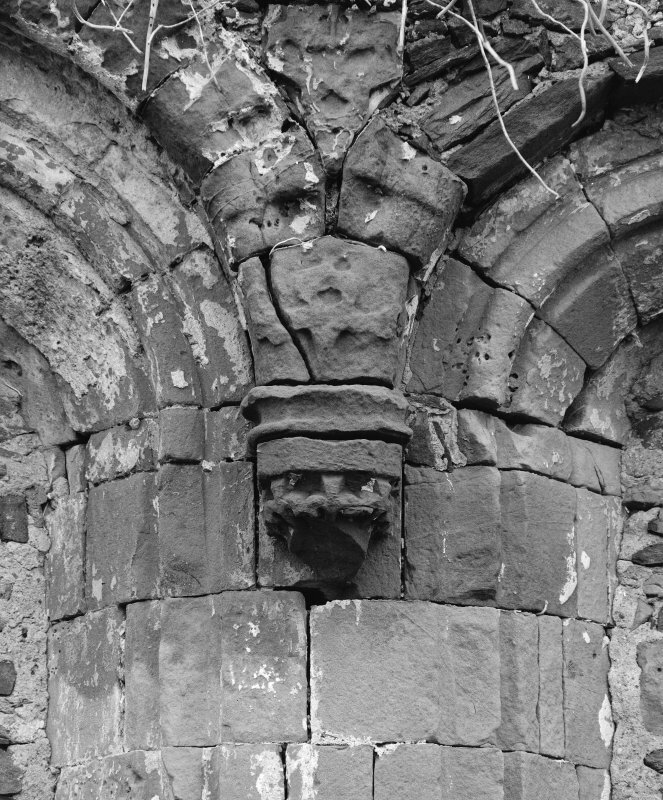 The former parish church of Killean is of interest both as a surviving fragment of twelfth century architecture and as the focus for a wide variety of funerary monuments. The church is now ruined, but three periods of construction can be seen: the nave (12th century), the chancel with the remains of an elaborately decorated east window (early 13th century), and the north aisle, which was taken over in the last century as the burial aisle of the MacDonalds of Largie, is originally of fifteenth century work. 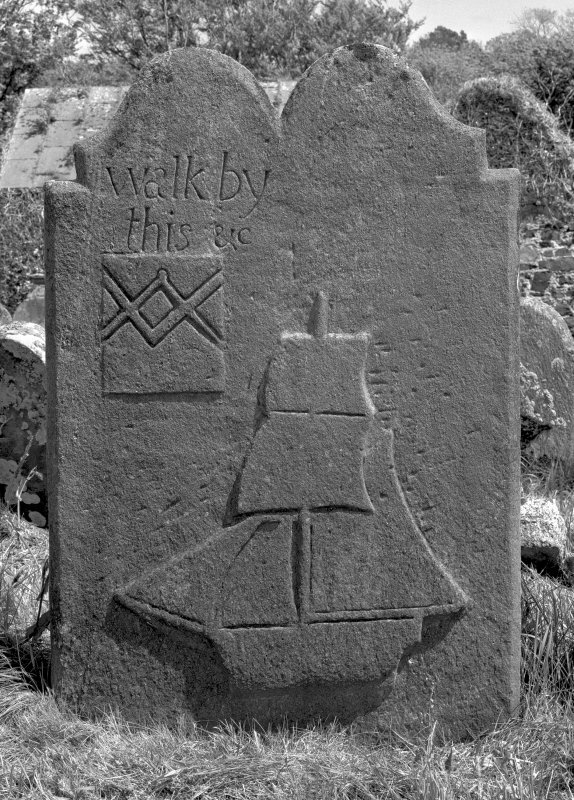 An Early Christian cross from the site is now in Campbeltown Museum; there are several medieval tombstones set in the north aisle of the church, and several interesting later stones in the churchyard. Three of the medieval stones are illustrated here: the first has a fine sword to one side of the slab with two stems on the other; the inscription which is in Lombardic capitals reads 'John, Son of Ewan, had this stone made for himself and for his father'. The animal ornament below the inscription contains an unusual collection of beasts: a salmon is being chased by an otter, followed by a stag pursued by hounds. The stone belongs to the Kintyre School and dates to the 15th century. The second stone, of similar date, is a good example of balanced foliaceous patterning round a sheathed sword. The third slab is a beautifully carved example of a fully-armed knight: he has a pointed bascinet (helmet), protective mail covers his shoulder and neck and he wears a long sword with belt fastenings and a ribbed tunic. The stone belongs to the Iona School and is of 14th-15th century date. 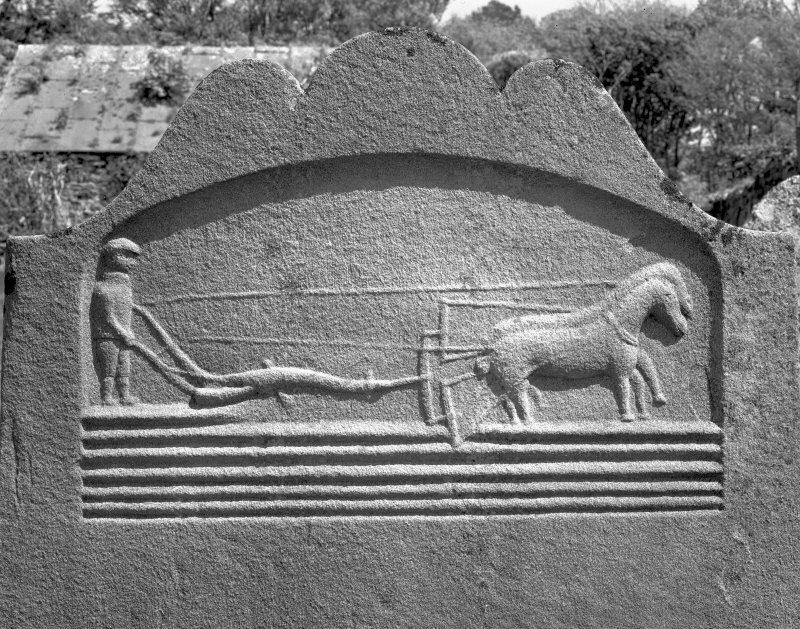 Several 19th century headstones in Kintyre cemeteries provide vivid insights into contemporary agricultural life; here at Killean the stone commemorating Donald McKinnon, who died in 1810, illustrates ploughing with a two-horse team. 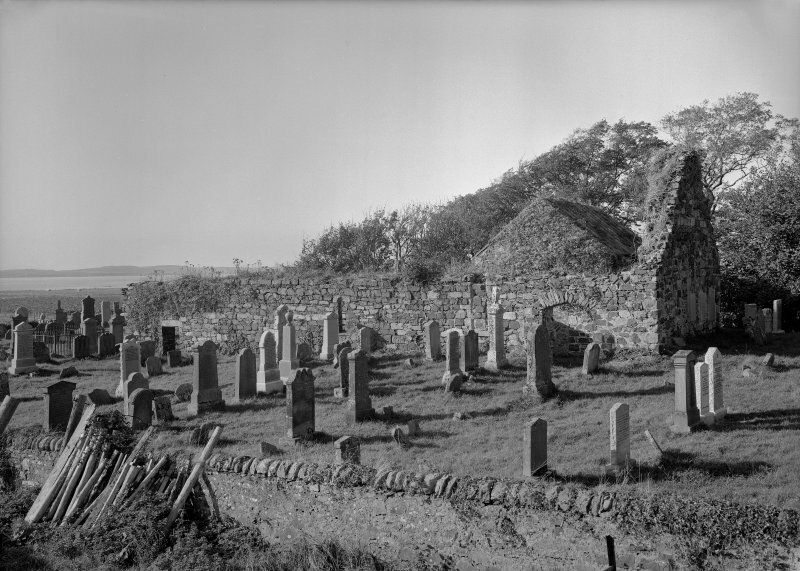 NR 6951 4456 Killean Church (ruinous) and burial ground. 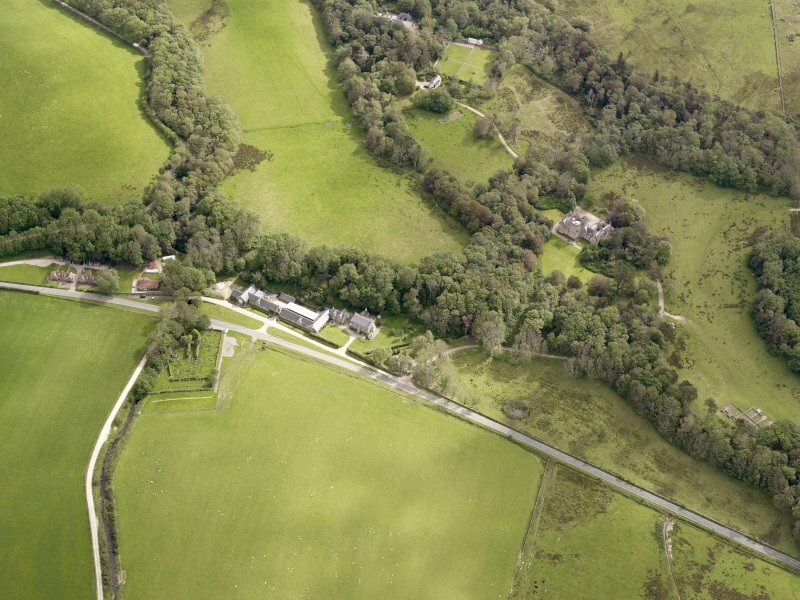 The pipeline crossed directly E of the entrance to the churchyard but no archaeological features were noted. Several modern artefacts were recovered along the length of the trench and it is thought that the mixed nature of much of the trench is related to its close proximity with the modern road. Late 12th-century parish church of St John. (1) Slab, now in Campbeltown Museum; 0.51m by 0.33m, trimmed at top and one side. Face (a) bears in false relief a Latin cross between four crosslets with pellets in the angles. On face (b) is a similar cross. The lower margin has been rebated to fit a socket-stone, perhaps on a free-standing 'altar' or leacht.